If you are looking for an attractive, low growing perennial with plenty of varieties to choose from it is hard to go wrong with the daylily (Hemerocallis spp.). A mainstay of gardens around much of the country, they can be a great addition to the Florida-Friendly garden. A member of the Lily family with grass like foliage, daylilies are mainly planted for their flowers. Flowers usually only last for about a day each but they may rebloom on the same stalk. Color, size, and timing of flowering differs heavily between varieties. A good resource to contact for quality varieties for your area is through daylily societies. 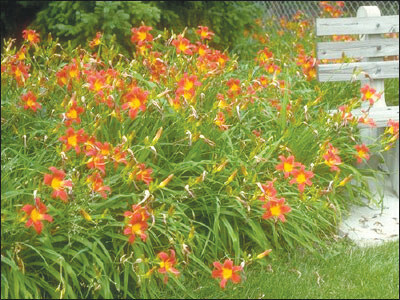 This information can be found at http://www.daylilies.org/AHSreg12.html . The flowers and buds are also edible. Daylilies do best in full sun or filtered shade, such as underneath pine trees. Amending the plating bed with 3-4 inches of organic matter is be a good idea. They can be readily found either potted or as bare root plants. With either, make sure the crown of the plant is at ground level, water well and use mulch through establishment. Many varieties grow quickly and can be divided usually every 3-5 years if they become too crowded. Daylilies do not have many pests, with aphids, thrips, spider mites and grasshoppers being the main problems. Daylily rust is a possible disease that is unlikely to kill a healthy plant but can make the foliage very ugly. Look for varieties that are resistant to the disease and remove any infected leaves or plant material as soon as it is seen. ur local UF/IFAS Extension Office.